Presented by Face® Construction Technologies, Golden Trowels recognize the flattest and most level floor slabs placed in the world in the previous contest year. To date, 340 Golden Trowels have been presented to 130 different contractors on four continents. Golden Trowel® Gold Plates are awarded to the winner in each category; Golden Trowel® Silver Plates recognize outstanding entries that did not win their category. The 2018 Golden Trowel® contest year runs from September 1, 2018 to August 31, 2019. Applications are due by September 30, 2019. 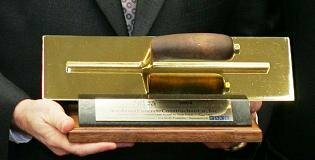 A special Golden Trowel®, The “Sam” Award, was established in 2002 to honor “outstanding accomplishments in and contributions to the art and science of high quality horizontal concrete construction.” The Sam is named in honor of Samuel A. Face, Jr., the late Chairman of The Face Companies. Winners are announced each year at The World of Concrete in Las Vegas. Email Dipstick@Faceco.com for an official application. The Face® Companies, in cooperation with Concrete Floors Asia, are proud to present The Golden Trowel® Asia Awards competition for projects in Asia. The first Golden Trowel® Asia Award was presented in 2015. The Face Companies developed the Golden Trowel® criteria for the Laser Screed categories with the cooperation of Somero® Enterprises beginning in 1990 contest year.